A month to go and one of the channels on the TT goes down. After compulsory panicking and hitting components, its b.r.e.a.t.h.e. and swop cables/valves about to identify the fault. So its off to see that nice Mr Willis (Tom) @ Art Audio this afternoon. While I'm at it, he's going to repair the on/off switch on the AA Concerto power amp thats been stuck, ON, for the last 2 years. Hope he hasnt got anything tasty/tempting in that shed of his. You guys got anything a bit bowel loosening going on? Pls stick to hifi related topics lads. I'm selling all mine and buying a NOS Sony Walkman WM-22:^. Or just fit another arm with a removable head shell! 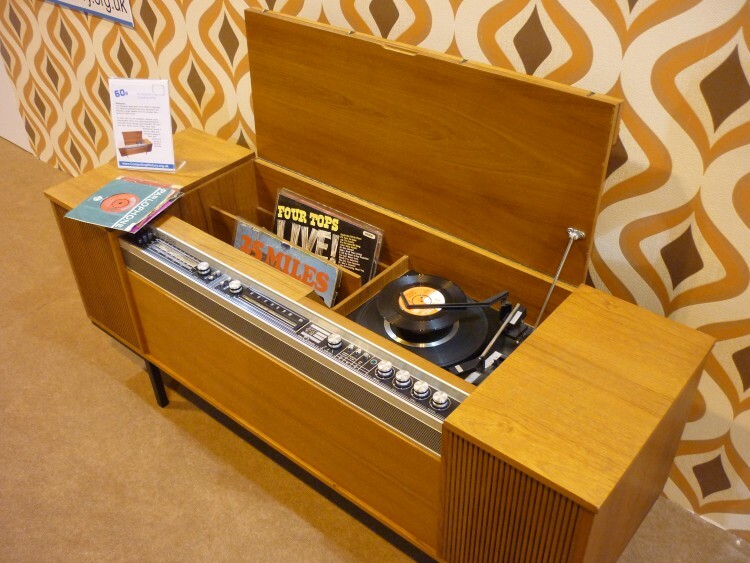 You're getting on a bit mate, so how about something that will store your vinyl, play records, theres an AM radio and it has one of them record stacking gubbins so you dont have to keep getting up out of your wing back chair. And its a fine peice of retro interior design.. I decided to change the Dac in my system. Which involves a new pc, and about 20lb of new cables, with luck it will all work. I'm half way through building another amplifier and I need to add a volume pot to my valve amp. Sonic quality apart, I can understand why these things were so popular, as they are very practical. All in one box, no untidy cables and a nice piece of furniture when not in use. Looking through my HiFi Yearbooks, the 1970s had lots of very nice cabinets, with cutouts for Quad or Leak units especially, cutouts for Thorens or Garrard turntables and Revox or Ferrograph tape machines. Then somebody had the bright idea that special supports were needed, and it all went to open racks. I reckon that a lot of the trouble many of us have with SWMBO is that our stuff is all open, cables visible, loudspeaker stands that look like Oil Derricks whereas we could probably do what we liked with kit if it was all held inside a nice sideboard. I landed a sub on ebay...if I can fit it in the car with all the other c**p it's coming too. Not all of us. I get away with a great deal but radiograms are strictly BANNED in my house! It's not the radiogram, but it's having a nice cabinet that looks like a proper piece of furniture. The cabinets made by Hampstead High Fidelity or Holder Pearce to house Garrard/Thorens/Quad/Leak kit weren't radiograms but were very attractive pieces of furniture. Mains switch on power amp replaced By Tom, so got some music back. Faulty SUT will be about a week. Still messing about with different speakers. Looking forward to seeing your glitter ball. Oh Steve, you're such a tease!